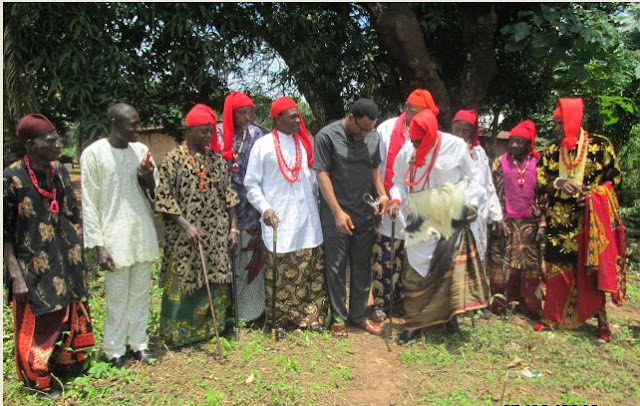 The Isobo are the most eastern sub group of the Igbo nation domiciled mainly in Obubra LGA of Cross River State as well as part of Ikwo LGA of Ebonyi State. The major center in Ikwo LGA is Akpawudele(Ekpa-Omaka), with some remnants in Ndi-Oka, Ndiagu, and Amagu. They are possibly an offshoot of the Ikwo sub group and also within the same Obubra LGA are the Echara people who are by the way neighbors of the Isobo people. In Obubra, the three major clans are Isobo-Bikobiko; Isobo-Otaka and Isobo-Otaka. They dominate Osopong 2 ward out of the 11 wards in Obubra covering 18 polling units out of the 155 in the LGA. So based on the rule of thumb, we can assume the Isobo and Echara people make up about 12 per cent of the population of Obubra as well as the land area. This means the Isobo people probably occupy about 130km2 of land area and number some 20,705 people based on the controversial 2006 census exercise.Remnants of the Isobo people are found according to ISOBO Community on facebook in such places like Nd’Oka; Okwuenyim, Nd’Nkash; Appiapum; Nko; Imabana-Ochokwo; Igbo-Imabana and Igbudu mainly in Obubra as well as enclaves in Abi and possibly Yakurr LGA of the State. The scattered enclaves of the Isobo people was noted by Ecoma Chinyere who wrote on the nature of trade and commerce in the Upper Cross River area. History says they migrated from NCHONU which will put them as part of the Ikwo larger group. This was between 300-400 years ago when they began gradually mainly to conquest to settle in the area. The major festival is the new yam festival called the AJI. Their neighbors to the east are the Mbembe people who dominate Obubra LGA. Because of their proximity to their Mbembe neighbors, the Isobo apart from using the traditional week days of Eke, Afor, Orie and Nkwo(which is their market day) had adopted the 6-day week system practiced by the Mbembe people. Their main market in the Ebonyi State axis is the Igboji market. September the 5th is not only the NEW YAM FESTIVAL DAY for the Isobos,but also marks the climax of myriad of very unique cultural protocols heralding the celebration of the new yam each year. Of course,yam is well celebrated above other tuber crops especially among the Igbos and the Isobos are not left out in this generational practice. Among the lined up cultural rites and activities, the celebrations is kick started with the announcement of the FESTIVAL OF THE PUMPKIN LEAF ( OKPATA INE) by a member of the Council of Chiefs commissioned with that charge. This is usually a cultural celebration exclusively for ND’OVA (Council of Chiefs).It is pertinent to note here that in this particular occasion,the new yam is not involved. The Ova concerned treats the Nd’ Ova to a lavished entertainment immediately they return from the Ezegwuk (Great playground); where sacrifices are offered to the gods for a bountiful harvest. Significantly, it offers hope and strength to the people that at last, the period of famine is drawing to a close. Then it is followed by the big one-EJA NJI (Yam sacrifice). The Eja Nji is the most important of all the rites heralding the new yam.All the seven OVAs representing the seven kindred in Isobo are fully involved.All the Chiefs adorned in their best apparels and attires undertake seven spiritual journeys shuttling between Ezegdwuk and Edgwuk (Village playground) during which time prayers and sacrifices are made for good harvest. It is a purification journey as the gods are called upon to execute judgement on those who may have desecrated the land. Those who have tasted the new yam before this celebration are seen to have desecrated the land and forbidden from watching the final dance when the OVAs will be showing their dancing skills. The high point of this occasion is usually the scramble for who would ‘catch’ the OGBUNZE (The first amongst the OVAs to eat the new yam) as he was usually the first to dance; fast dance with a speed of light.Only few people have been able to achieve this. At the end of the dance,each of the Ovas carries his goodies bag to his clan where his people are usually handy to receive and welcome him home and gifts therein shared round; followed by merriment that sometimes last till late in the night.Each clan had a different way of celebrating this day and it also ushered in uncommon kind of love as it was a desecration of the land at this time to quarrel or fight.Violation attracted payment of fine.This is usually the case until four days after the New Yam Festival. The next day is the OGBUNZE.This particular day is almost like the festival of the pumpkin leaf except that the new yam will be harvested by the Ogbunze alone and the Ovas will be entertained by him.The Ogbunze is the enforcer of laws of the land that forbids fighting and quarreling.He collects fine from offenders. The d-day.Early in the morning,women rush to their farms to harvest the new yam; and the shouts of EKOOOOO EKOBEKO EKOGBANGHANA RIGBO FUA LECHECHE O filled the air. Often times as children, we were woken from our slumber by these shouts; that brought new lease of life to many who had been ravished by famine.Joy filled the air and there is excitement everywhere. New yam meal is exchanged by neighbours,friends and so on.The best harvester is rewarded. The men celebrate as they sit in the clan hut (Obu) to eat and drink together.The young men organize a novelty football match that is usually keenly contested. At night,it is rounded off with an all night ball that lasted till dawn.That is Ekoo in Isobo. “Of course,yam is well celebrated above other tuber crops especially among the Igbos and the Isobos are not left out in this generational practice”. This is the sweetest part of this Isobo people.These people hold unto their Isobo identity, but still identify with the rest of the Igbo nation, even though we have not done anything for them, most of us don’t even know of their existence before today.No “my papa say we came from Bini” trash. No “we no be ibo we be Isobo people” trash. No ” Ibos want our land” trash, that we normally get from morally bankrupt set of people who deny brotherhood on the altar of transient economic and political gains.Just as honest and as cool as they come. Chukwu bless Isobo people.Are Ohanaeze Ndiigbo aware of these Igbos at the fringes of Igboland? What program exactly have they ever conducted in these parts of Igboland to show these our brothers that they are part of us and to give them a sense of belonging.What is exactly the function of Ohanaeze Ndiigbo? Someone remind me again. I am an mbembe man (prophet of God by grace) from Obubra LGA, I got married to an Igbo lady from Aguata, in Anambra State cause I love the Igbos. Well constructed article, we live together(the Isobos). I'm waiting for the Biafra new Yam festival. Pls tell the Deputy Director of IPOB that the struggle,agitation and rally should continue even without Nnamdi Kalu. If buhar-ia keeps him and the struggle still continues, they will see no reason for holding him back. The struggle for Biafra freedom should be in front, not Nnamdi Kalu. All hail BIAFRA..
DEAR PROPHET EBOKPO IN BIAFRALAND,WE APPRECIATE YOU LOVE AND TRUTH FOR FREEDOM.WE ACKNOWLEDGE MBEMBE,ISOBO AND ALL BIAFRANS IN AKWA-CROSS AND BEYOND OK.DEAR MAN OF GOD,ALREADY LEADER NNAMDI KANU HAS GIVEN THE ORDER THAT BIAFRAN MOVEMENT MUST CONTINUE WHILE HE IS UNDER PHAROAH'S PRISON AND SUCH IS ACCORDING TO GOD'S PLAN.THE MOVEMENT YOU SAW INTO CROSS RIVER (ISOBO,MBEMBE ETC)IS A MANDATE TO LIBERATE ALL PARTS AND SUCH IS A DIVINE MANDATE OK.THANKS FOR MARRYING A BIAFRAN,A LOVELY SISTER FROM AGUATA IN ANAMBRA STATE OF BIAFRA.SIR,OUR PRAYER FOR YOU IS TO GET READY FOR GOD'S USE IN BIAFRALAND AND PLEASE NEVER BE LIKE THESE FALSE PROPHETS IN ZOO-NIGERIA OF TODAY AS YOUR SERVICE FOR GOD OF GAD(GOD OF ABRAHAM,ISAAC AND JACOB),CHUKWU OKIKE ABHIAMA IS NEEDED AND IN SPIRIT AND TRUTH OK. AGAIN,NNAMDI KANU IS A LEADER YOU MAY NOT KNOW FOR NOW BUT SHALL SOON UNDERSTAND BETTER OF HIM IN HASHEM/GOD AND CULTURE OF NDIGBO AND ALL BIAFRANS.SO,YOUR REQUEST FROM DEPUTY DIRECTOR OF IPOB IS NOTED BUT BE ASSURED THAT IPOB IS NNAMDI AND NNAMDI IS IPOB OK.AS NOBODY CAN HOLD BACK AIR/RUACH/HOLY SPIRIT,SO SHALL MBUHARI AND NIGERIA CAN NEVER OVER IPOB/KANU.AS NNAMDI MEANS IPOB,OUR MOVEMENT INTO CROSS,RIVERS,BAYELSA,DELTA,EDO-PARTS,BENUE-PARTS,KOGI-PARTS(BIAFRALAND)IS HEADED/LED BY NNAMDI KANU OK.FINALLY,WE LOVE YOU SIR AND CONTINUE IN PRAYER AND YOU SHALL SEE WONDERS OF GOD OF ABRAHAM OVER CURRENT PHAROAH CALLED MBUHARI AND THEN YOU WILL UNDERSTAND THE CODED WORDS IN THE SCRITURES--GENESIS.PLEASE,LISTEN TO YOUR SERVANT/BROTHER:THIS NIGERIA AND HER MBUHARI YOU SEE TODAY SHALL BE SEEN NO MORE! AS THE LORD LIVETH,ALL EVILS AGAINST BIAFRANS BETWEEN 1967-1970 SHALL BE JUDGED SOON BU GOD WE KNOW AND SERVE.EKWE-GA-EKWU NDI NILE GBURU UMUIGBO NA NIGERIA.YOURS THE BIAFRAN RABBI.